CRM software is a tool that's designed to help your organization offer your customers a unique and seamless experience, as well as build better relationships by providing a complete picture of all customer interactions, keeping track of your sales, organizing and prioritizing your opportunities, and facilitating collaboration between various teams. The idea of how businesses approach customer interactions and building relationships with them forms their CRM strategy. It involves collecting customer data and analyzing the history of customer interactions to provide better services and build better relationships with the customers to ultimately drive sales and revenue. Why do you need a CRM strategy? Without a proper CRM strategy, your customer information will be all over the place, and it'll be hard to keep track of all the touch points and interactions you've had with particular customers. This leads to a drawn out sales cycle, with a generic and sub-par customer experience. When you have a strong CRM strategy for your business, it allows you to build personal connections with customers, which in turn helps you identify their needs and requirements and provide them with personalized services. Great customer relationships are based on the consistent and personalized experience offered by your organization, regardless of where a customer is in your sales cycle. This means that every team in your organization, from Marketing to Sales to Support must offer a consistent experience when interacting with a customer. When your business is starting off and you're managing all your customer information on spreadsheets, this may be viable, but not advisable. The amount of time spent on data entry could be better spent bringing in customers and closing deals. This becomes exponentially more complicated when you grow your business and expand your customer base. This is where CRM software comes into play. The origin of modern CRM software can be traced back to the late 80s and early 90s, that saw the development of Contact Management Systems (CMS), which then evolved into Sales Force Automation (SFA) technology. As the industry grew, vendors were pushed to provide a broader set of services to cover everything from marketing to presales and support. A CRM tool is designed to remove silos in customer information by gathering them in a central place, to provide a 360º view of all your customer data. Details like the customer's name, email, phone number, and communication preferences, as well as interaction and purchase history, can be made available to help your teams reach out to customers for the right reasons and through the right channels. For every $1 invested in CRM, you get $8.71 i in return. An ROI of greater than 750%! It's hard to make important decisions when your customer data is spread across your excel sheets, business cards, and notes taken during meetings with the customer. It takes too much time and effort to collate the data and make sense of it. This is a derivative of the first indicator. Due to the absence of a centralized location for your customer data, salespeople will find it impossible to keep track of every detail as your customer base grows. A synergy is required between Marketing, who nurtures the lead, and Sales, who closes the deal. Often this lack of information flow hurts the performance of both teams, as neither is aware of what the other team is doing. 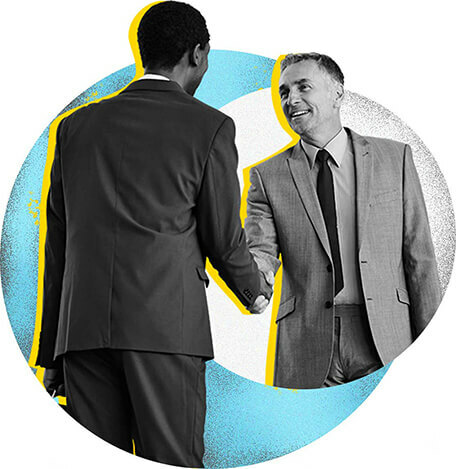 When sales reps leave your company, they take with them the relationships they built with customers. Your company needs to invest time and money into training replacements and getting them up to speed on customer preferences. Scattered information makes it hard to find patterns and personalize your interactions with customers. This ends with all customers being treated the same—and runs the risk of driving them to your competitors for a better experience. Taking your customer data and business processes to a new platform can be a daunting thought. Will the software be right for my business? How much will it cost me? Will I have to move to different software when my business grows? These are some of the questions that you'll probably ask yourself, so we've made it easy for you to choose the right CRM for your business. Effective sales organizations are 81% more likely to be practicing consistent usage of a CRM tool. When choosing the CRM tool for your business, the first choice you'll be making is between on-premise or cloud CRM software. Before you make that choice, let's take a quick look at the pros and cons of both. Cloud CRM software is built and maintained by the service provider, on their servers. The service is accessible over the internet through a browser, allowing you to deploy the service without any software installation on your organization's computers. On-premise CRM usually involve setting up servers in your office and installing the software on all required devices on your local network. This puts the responsibility for upgrades, customization, and maintenance solely in the hands of your IT department. Requires no additional infrastructure other than a browser and a working internet connection. Requires you to set up servers on your business premises. Your CRM data is accessible from anywhere and any device. CRM vendors provide a mobile app for accessibility while on the move. Your data is hosted on local servers and can only be accessed by devices on your local network. Building mobile applications requires an extra expenditure of time and money. 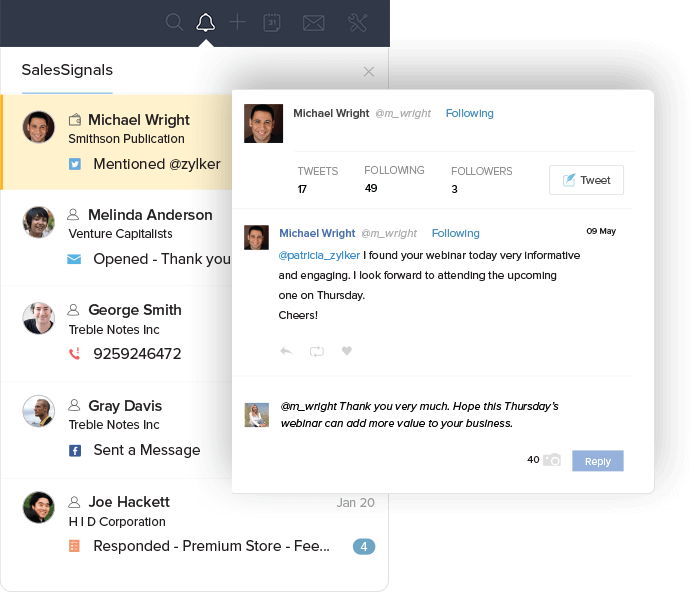 Cloud CRM offer free trials, so you can test the product and see if it meets your needs. No trial is available, as you need to have the infrastructure on premises to run the application in the first place. A pay-as-you-go plan, allows you to pay an upfront subscription fee for your total number of users on a monthly or annual basis. A large upfront cost for server and software installation, as well a monthly licensing fee for the software. Depending on the vendors, customization options vary, but are often readily available and quick to deploy. The deployment period is longer and more labor-intensive. Easily integrate with other business applications and through APIs. Depends on the vendor, but requires expert knowledge and additional costs. Vendors are dedicated to providing robust security measures and access control to ensure the safety and integrity of your data. Your organization will be responsible for the monitoring and protection of user data. You will have to dedicate a team, and considerable resources, to keeping your security and privacy measures up to date. On-premise CRMs were the go-to choice of organizations a decade ago, with 88% of buyers choosing on-premise CRM over cloud CRM software. But the tables have now turned, as 87% of businesses prefer a cloud CRM tool over an on-premise solution. Cloud CRM is the way to go if you want to have your data accessible at all times, as well as the flexibility to scale up or down with ease. It's also easier for small businesses to adopt a cloud CRM and be more productive without straining their budget. More often than not, the thing that stops businesses from adopting new technology is the fact that teams are uncomfortable with using it. So it's important to ensure that the CRM you use offers a clean interface, a great user experience, and is easy to pick up for everyone who'll be using it. Every business is unique in their process and needs. An ideal CRM for your business would be one that can be easily customized to meet those requirements. 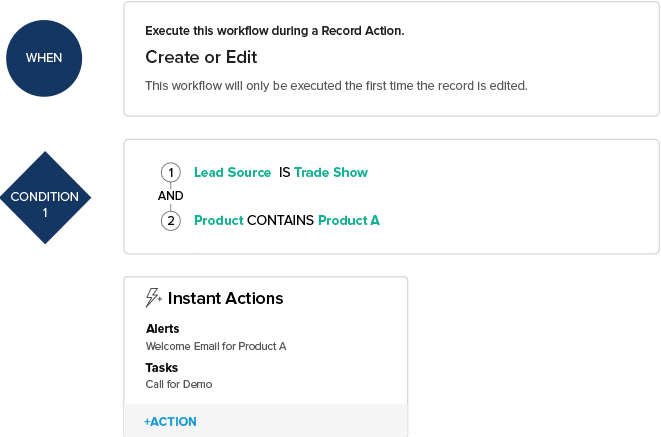 A CRM that can be molded to reflect your business process by adding additional modules, creating custom processes, automating repetitive tasks with workflows, and more. If your business has an ambitious year-on-year growth target, the CRM must be able to grow with your teams and business by supporting additional modules and custom processes, and integrating with third party applications that you may be using. We live in a time when mobile internet traffic has overshadowed desktop traffic. If you have a sales team in the field, it's important to ensure that they have access to customer data at all times. This allows them to be on the move, close deals more effectively, and keep everyone in the loop. With concerns for data security at an all-time high, a cloud CRM with secure data centers and industry standard security practices allows you to continue doing business without having to worry about your customer data being compromised. If you have all your data on excel sheets, or if you're using another CRM, it must be easy to get your data into the new CRM software and have your business up and running as soon as possible. This migration process must be quick and easy to execute for the CRM that you want to implement. 2424% of salespeople achieve their annual quota with mobile access to CRM data. 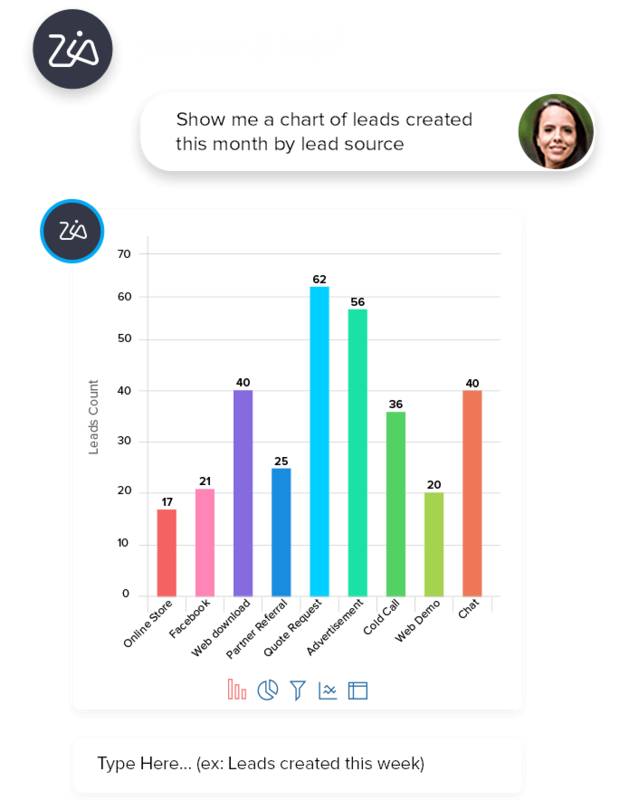 A CRM can help you identify, nurture, and follow up on quality leads. This means that you don't waste time and resources on a prospect that probably won't become a customer. Combined with a reduced sales cycle, you can guide more leads more efficiently and convert them to happy customers in a considerably shorter time. Help your team stay productive by defining and building efficient processes for your business. A CRM can help you ensure that standards are followed while processes are executed. Make sure your sales team's time is spent on closing deals and not wasted on mundane tasks by automating routine activities. Accurate data from across your organization helps keep your decision makers informed, so they can react to market trends with better decisions. Detailed reports will show how your teams are performing and where there's room for improvement. You can rest assured that your customer data is safe in your vendor's data centers, safeguarded by top-of-the line physical and digital security mechanisms. If you're based in the European Union or do business with European customers, a CRM that offers GDPR-compliance features will be one of your greatest assets. A CRM with a mobile app ensures that your team has access to important CRM data, no matter where they are. A sales rep in the field can pull up information about nearby customers, drop by for a meeting, and easily update everyone else on any new information by logging it in the CRM through their mobile app. A CRM arms your team with all the historical data of a customer, as well information regarding similar issues faced by others. A centralized repository of information helps your team resolve customer inquiries quickly, ensuring they leave satisfied. 47% of polled CRM users said that CRM had a significant impact on customer retention and an equal amount of users stated that it had an impact on customer satisfaction as well. Zoho CRM comes with features from multichannel capabilities to pipeline management and automation, all bundled in one package. You can experience what Zoho CRM can do for you for free, before you commit to adopting it, across your organization. With 24x5 standard support and 24x7 premium support, a team of experts are ready to assist you at any time. Bring in quality leads, nurture them, and turn them into happy, paying customers. Get a complete view of all customer data—personal details, all communication you've had with them, and more—all in a single place. 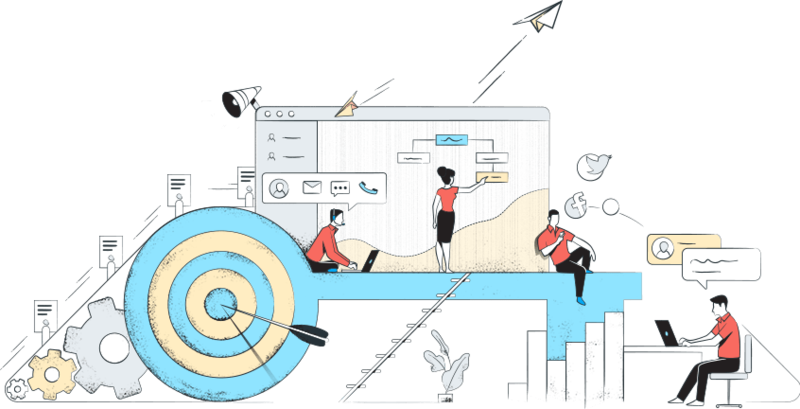 Instead of having your sales team waste their time doing administrative work, automate all your routine and mundane tasks with workflows and macros to help your team focus on winning clients and closing deals. 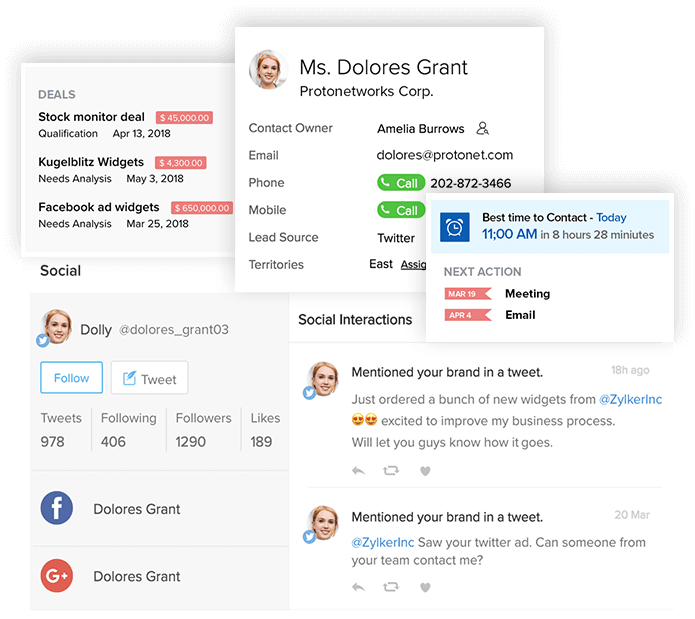 Reach out, respond, and stay in touch with your customers across email, telephony, social media, and live chat with a real-time notification system. Build better and long-lasting relationships through meaningful conversations. With Zia, Zoho CRM's AI, you get an interactive link to all your CRM data. Get predictions that help you focus on the right deals with the highest chance of closure, identify and remove bottlenecks, prioritize your response based on the sentiment of a customer’s email, and more. Sales reps saw productivity increase by 24.6% after adding social media channels and mobile access to their CRM. Customization within Zoho CRM was flexible and helped us get a CRM system of our own. We used Zoho CRM for both B2B and B2C sales processes. Automation helped us to keep track of everyday happenings and increased our ROI. Zoho CRM is essentially the brain of our company. It holds all of our memory. The operating system is very strong and has allowed us to grow very easily. My executives can generate workflow loads and custom functions themselves. It's incredibly useful for us; we can accomplish new initiatives quickly. We can accurately track the entirety of a customer's journey and manage our solar installation projects from start to finish. Zoho CRM provides the tools to create the methodology and culture to accomplish our goals. I think we can attribute our growth to tracking our sales pipeline in Zoho. It's completely free and doesn't require a credit card.